The outbreak began in New York. Within days the world descended into chaos as the infection spread to every corner of the globe. Across Britain, millions of people are told to leave the less defensible villages, towns and cities for the safety of one of the enclaves being established around the coast. For George Tull and the other residents of the Waverly-Price Retirement Home, evacuation is not an option. Finding the staff have left, George has to choose between trying to save those he loathes, or abandoning the woman he loves to an uncertain fate. 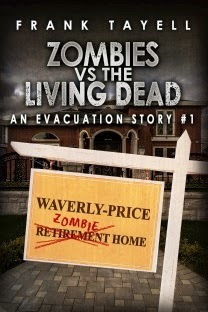 "Zombies vs The Living Dead" is the first in a series of short zombie stories recording the aftermath of the outbreak, and is a companion piece to the series “Surviving The Evacuation.” both are available now from Amazon.